Students at Mudgee Public School are getting the most out of their day, thanks to the breakfast club that runs three mornings a week. With some students having to get on buses at 7am and school not starting until a quarter past nine, staff were concerned that some students weren’t eating before their bus ride or not eating enough to get them through a busy day until lunchtime. The school had seen a need to provide their students with the means to continue learning to the best of their ability. The breakfast club operates on Tuesday, Wednesday and Thursday mornings (8:45-9:10am) and provides more than 100 students with cereal, toast, juice and Milo provided by local businesses. The menu also includes scramble eggs on Tuesday, cheesy toast on Wednesday and baked beans and spaghetti on Thursday. Woolworths have been providing Mudgee Public School with fruit for their Crunch ‘n’ Sip program for the past two years and stepped up their support for the breakfast club by providing ingredients. Mudgee Coles Store, Macquarie Valley Juice, and Mudgee Milk are also a huge support for the program. 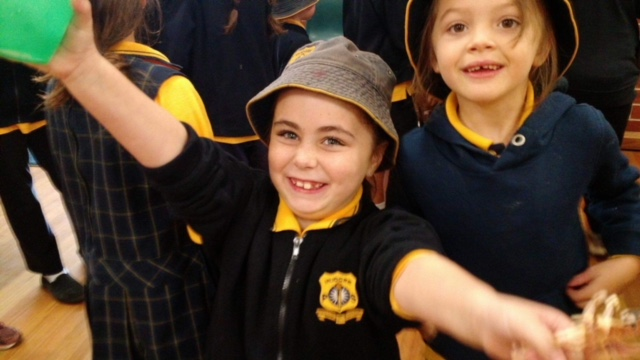 Mudgee Public School staff are extremely thankful to everyone who had supplied items so far. Mudgee Public School would like to thank the following local businesses who kindly support our Breakfast Club. Mudgee Woolworths, Mudgee Coles , Macquarie Valley Juice, and our wonderful volunteers. If you are able to help out for an hour on Tuesday, Wednesday or Thursday morning, please contact the school so that we can welcome you.